GeezEdit is a powerful application for use in many iPhone 6 and iPad applications. After downloading the app the Amharic Typing icon appears. Next go to Settings > General > Keyboard > Keyboards and select Amharic Typing. Go back to Settings > General > Profile and install Geezedit. You may also see this instruction. Tap on the Amharic Typing icon and the GeezEdit screen appears with an English keyboard. To get to the Amharic keyboard just tap on the Globe icon. If emoji keyboard appear, toggle through the Globe icon until the Amharic keyboard shows up. You are now ready to enjoy Amharic. Help is on the right top corner. Upgrade to iOS 8 to use GeezEdit in iPhone 4s and 5. 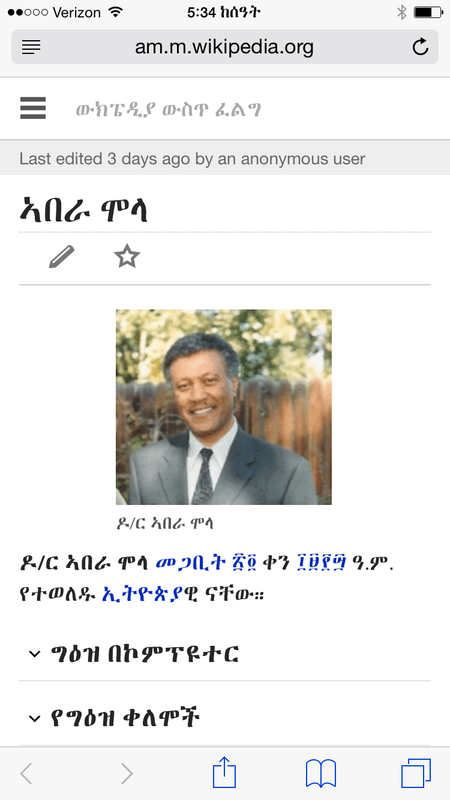 የግዕዝኤዲት ቁስ በሚገባ ኣይፎንና ኣይፓድ ውስጥ በዓማርኛ ሥርዓት እንዲያሠራ የመጀመሪያው ቋንቋ ዓማርኛ መሆን ይኖርበታል። ይኸንንም ለማድረግ በSettings > General > Languages & Region > PREFERRED LANGUAGE ORDER ስር አማርኛ Amharic የሚለውን መምረጥ ነው። ለመቀየር ከእዚህ በላይ ያለው ሥዕል ውስጥ እንደሚታየው Edit (ኤዲት) የሚለውን መጫን ያስፈልጋል። Go to Settings > General > Languages & Region and Select አማርኛ Amharic as the first PREFERRED LANGUAGE ORDER for effective use of the system. Tap on Edit to change it.